Mechanical snap-action thermostats for heating systems. 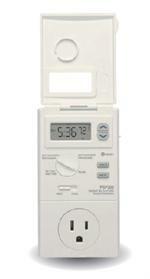 Battery powered, digital thermostat with large, easy-to-read display for heat only systems. 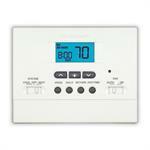 Digital Electronic Non-Programmable thermostat for heating and cooling systems. 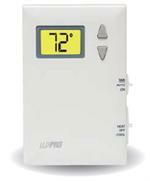 Nonprogrammable digital thermostat for single stage heating and cooling systems. 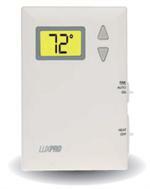 Non-Programmable thermostat for heating only systems. 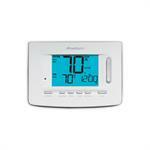 Easy to use programmable thermostat (separate weekday and weekend) for heating and cooling systems. 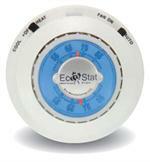 Easy to use programmable outlet thermostat for window air conditioners and portable space heaters. 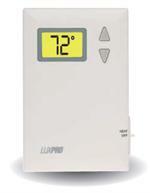 Fully programmable, digital thermostat with auto changeover for control of single stage heating and cooling systems.